After countless revisions we finally have a label designed! 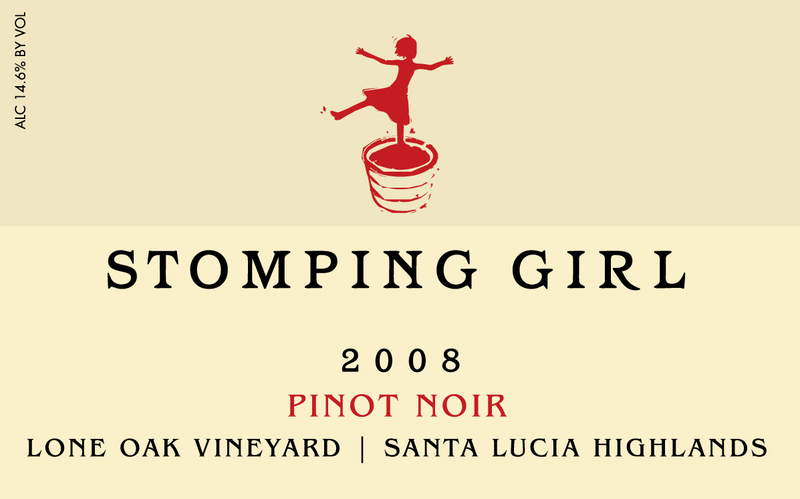 a playful depiction of a girl stomping grapes while daydreaming of other activities and we loved it. Our label designer, Hayley, then worked with us to come up with many label design concepts, incorporating the logo in different ways. Ever so patient with us, Hayley produced countless iterations. We tried the girl at the top of the label, on the side of the label, jumping out of the label, in the middle of the label, on the bottom right of the label. We made the girl black, burgundy and purple. We had to fit the varietal name, year, appellation and vineyard on a small 4″x 2″ space. We tried many different fonts; we tried all caps, small caps, no caps, you name it! And let’s not forget all government mandated warnings that need to fit on there too. We tried different types of paper, different sizes of paper; different types of bottles and different color capsules. We got feedback from graphic designers, friends and relatives. It was more time consuming than one would imagine. Ultimately, however, one hopes that what is IN the bottle matters much more than what is ON the bottle. I agree with one label designer who was quoted as saying it is their job to help sell a customer that first bottle of wine but it is the winemaker’s job to keep that customer coming back for more. Our 2008 is tasting wonderful right now, and, it’s nice to see a label matching the quality and craftsmanship of what is in the bottle! Great name…great label…and with the love you guys put into it I am sure a GREAT WINE!!! Love it too! Who distributes your wines? Thanks Eric! all ‘distribution’ is done thru our mailing list. Love the label! So simple and classic! Thanks Lisa–we are getting excited! I think the label is great – it was well worth all of the time to develop it. Here’s to selling many first bottles of wine because of the label and many customers coming back because of the wine. Thanks for the good wishes and for your input on earlier iterations of the label! Great idea for a label. It’s always fun to put your own unique imprint out there!